Guest blogger Emma Wojtowicz talks about an important day in GPO history. On October 24, 1863 – 148 years ago today – President Abraham Lincoln visited the Government Printing Office, the only sitting president to visit the agency. To celebrate the anniversary of his visit, Government Book Talk is taking another look at GPO’s own publication, Keeping America Informed: The U.S. Government Printing Office, 150 Years of Service to our Nation (the book was previously featured on this blog on June 15). GPO opened for business on the same day that Abraham Lincoln was inaugurated as President of the United States – March 4, 1861. The following year in September 1862, GPO printed the preliminary version of the Emancipation Proclamation issued by Lincoln as a general order. Then in 1863, Lincoln visited GPO by invitation from Public Printer John Defrees. Figure 1. 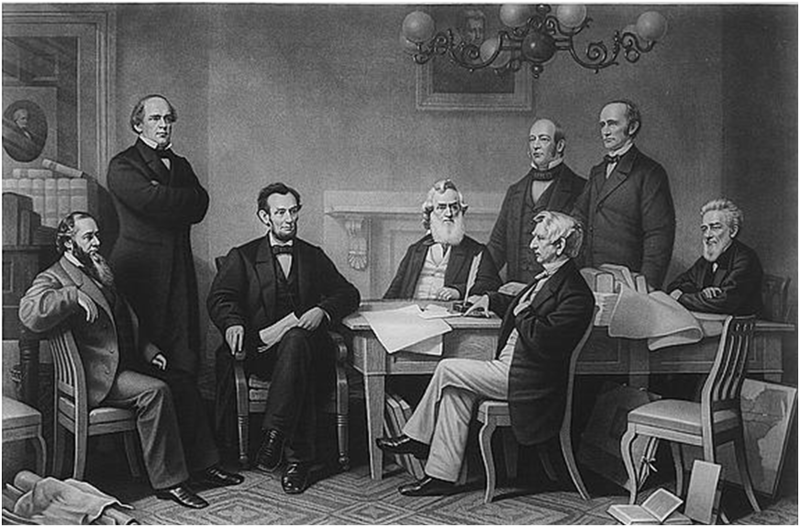 First reading of the draft of the Emancipation Proclamation by Abraham Lincoln to his Cabinet on July 22, 1862. These unknown facts about Lincoln are part of GPO’s history and foundation. For 150 years, GPO has worked quietly and diligently behind-the-scenes for Congress, the White House, Federal agencies, and the public. Keeping America Informed tells the story of the United States from the different and unknown perspective of GPO employees and their consistent contribution to the workings of the Government. The book is full of “did you know?” facts and tidbits of information, often accompanied by an illustration or picture. For example, did you know that GPO has produced the United States passport since the 1920s? Well, even if you did, you can learn a brief history of the passport – an idea originally conceptualized and produced by Benjamin Franklin, which identified the bearer as a trusted individual who was able to enter the U.S. The State Department took over control of the passport in 1856 and the single engraved page was produced by the Bureau of Engraving and Printing. 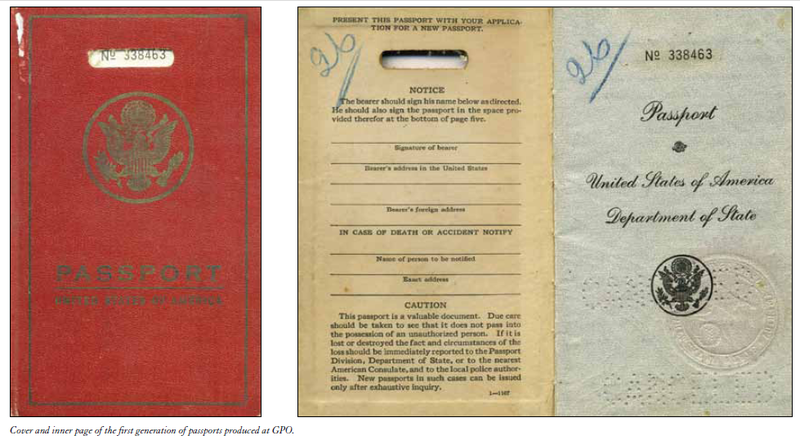 When in the 1920s the League of Nations created an international standard for a booklet-style passport, the State Department sought GPO’s services to print it, and has remained a loyal customer ever since. These types of facts and added background are what make Keeping America Informed a worthwhile read. Similar information can be found on the United Nations Charter, the Warren Commission, President George H. W. Bush’s 1991 inauguration, and the list goes on. In between, you can see historical photographs from GPO’s vast collection. The book was written, edited, designed, and printed by GPO employees, which is entirely fitting because the message of the book is centered on GPO employees and how they have played a major role in the history of the United States. Abraham Lincoln visited GPO when the agency was still in its infancy, yet working around the clock in support of the war effort. As the book details, GPO is a much different place today than when Lincoln visited; however, the mission of GPO remains the same. Keeping America Informed: The U.S. Government Printing Office, 150 Years of Service to our Nation is available through GPO’s online bookstore, retail bookstore, on our FDSys federal document database or in a library. You can see the original printer’s proof of the Emancipation Proclamation in person at GPO’s 150th anniversary history exhibit now through December 2011! Click here to watch a video of our 150th anniversary exhibit on GPO’s YouTube channel. The GPO 150th anniversary exhibit is open 8 a.m. to 4 p.m. Monday through Friday, except on Federal holidays. Read more about Abraham Lincoln and his rise to the Presidency in the National Park Service’s recent work commemorating the 150th anniversary of Lincoln’s inauguration: Abraham Lincoln’s Journey to Greatness.